(6) importantly, BATS, along with HOT, is one of only a few ocean time-series sufficiently longer than the time of emergence (ToE) to demonstrate ocean change in the context of natural variability (e.g., Santer et al., 2011; Keller et al., 2014, Henson, 2014; Henson et al., 2016; Neuer et al., 2016; Bode et al., 2017). 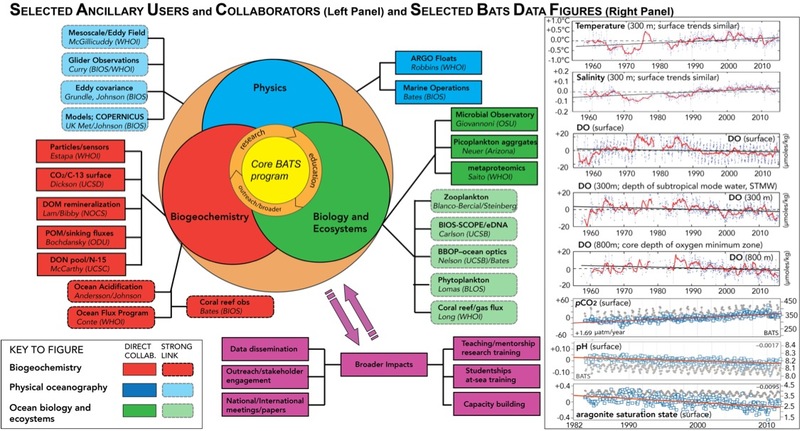 As of July 2017, nearly 600 peer-reviewed papers with substantive contributions of BATS data have been published since the inception of the project in 1988, with publication of 25 papers on average each year. Using Google Scholar, these 600 papers have been cited in the literature over 65,000 times, and the h-index and i-10 number for the BATS project are 129 and 544, respectively. Papers with BATS data have been cited approximately 4,500 to 6,000 times each year during the past five years. You can access a complete list of refereed publications utilizing BATS program data, organized by year of publication as of August 1, 2007, or view the BATS Google Scholar citation list, for more information on the scholarly impact of the BATS program. Long-term time series are a powerful tool for investigating ocean physics and biogeochemistry, its effects on the global carbon cycle, and its response to ocean change. Indeed, recent synthesis and modeling studies have suggested that time series needed to be of 20-30 years (at the equator) and 40 years (temperate latitudes) duration before an anthropogenic signal in ocean chlorophyll and primary production could be reasonably separated from natural variability (Henson, 2014; Henson et al., 2010; 2016). Multi-decadal observations at BATS also provide critically needed rates of change in the ocean carbon cycle, CO2 sinks and sources in the North Atlantic, and the longest global record of ocean acidification (e.g., Bates 2012; 2017; Bates et al. 2012; 2014, IPCC 5th Assessment). 1. Quantify the role of ocean-atmosphere coupling and climate variability on air-sea exchange of CO2, and carbon export to the ocean interior. Carbon export includes both inorganic and organic carbon (OC), and for the latter, both particulate and dissolved phases. Of particular interest, in light of clear evidence for ocean acidification, this research will quantify the ecosystem controls on partitioning of OC between particulate and dissolved phases, and their respective fates. 2. Document trends and the controls on the interannual to decadal scale variability in carbon and nutrient cycles to their coupling in the surface and deep ocean via the Redfield Ratio paradigm, and biological community structure in the oligotrophic North Atlantic Ocean in response to low-frequency climate variability. 3. Quantify the response of planktonic community structure and function, and impact on biogeochemical cycles (including new and export productivity) to variability in surface fluxes (e.g., heat, freshwater and momentum) and dynamical processes (e.g., eddies, Rossby Waves, internal waves) on. 4. Facilitate development, calibration and validation of next generation oceanographic sensors, tools and technologies. 5. Generate a dataset that can be utilized by empiricists and modelers to test new hypotheses and build a framework for educating and training future oceanographers. The BATS project has resulted in many papers and scientific insights into ocean physics, chemistry and biology during the past three decades. The relationships between primary BATS observations/research understanding and the broad network of ancillary users and collaborators fostered by the program are like the ocean food web, inextricably intertwined. An attempt at showing these connections is schematically presented in the figure below. As the BATS record extends to nearly three decades, our ability to observe and decipher relationships between climate and biogeochemistry continues to improve. The cliché has some truth in that the more we learn about the Sargasso Sea, the more there is to learn and understand, which in turn, reinvigorates our endeavors and the questions we ask. Schematic relationships between the core BATS program, and selected ancillary users and collaborative researchers with selected examples of connections to BATS PIs as selected examples. Warming, salinification, ocean deoxygenation, pCO2 , pH and aragonite saturation state trends at Hydrostation S/BATS and BATS also shown.